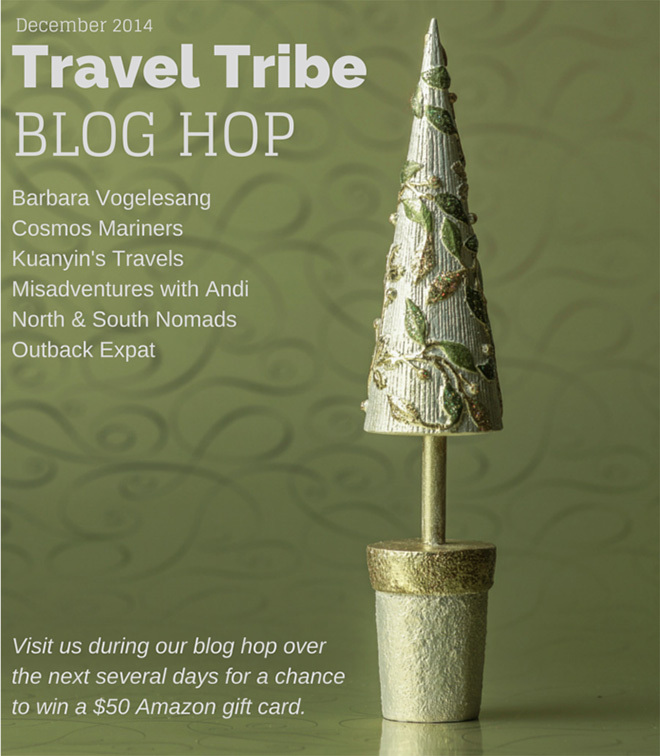 Over Christmas you may remember that I took part in a Blog Hop with my Love Blog Travel Tribe. My Travel Tribe is made up of 5 fantastic travel bloggers who write fun and interesting posts that I always love to read. They are also really supportive which is the backbone of any tribe I think. I really wanted to introduce them to you and so below are some of the posts that they have written which I have enjoyed and hope that you do as well. Andi currently lives and works in San Francisco (so so lucky!) and is married to a french man! Andi writes about her daily life, travel, food (lots of food), movies and social media. J’adore Gifts for Bloggers – whats not too love about gifts especially if you are a blogger and they are perfect for you! Your Life in Movie Moments – I love going to the movies almost as much as reading (though not so much watching movies based on books!) so this post was very me. Saturday Six#131 – food, food, food what’s not to love! Shawn who is Canadian and Jess who is Australian are the Nomads and Jess is a lawyer like me! They currently live in Thailand but have lived in Australia, Canada and the United States. Their blog is a food and travel website detailing their travel adventures and the amazing food they have tried and created. Five Best Tofu Recipes – Jess is a Vegan and these look like such delicious tofu based meals. Since coming to Darwin I have had tofu quite a few times and have discovered I really quite like it these days so I would definitely be keen to try these. Lake Louise, Canada – These photos look so lovely. I’ve never heard of Lake Louise before but I would love to visit it now after reading this post. Stranger Side of Travel – this post made me laugh (sorry!) as it is the kind of situation I find myself in frequently. I’m always being stopped to give directions (opening my mouth and speaking with an English accent makes people look very apprehensive when they want directions you know) or just having strange and random people start conversations with me! Denise and her adorable son live in Thailand as well but are often found globetrotting (most recently to Cambodia) together. The Lowdown on our Cambodian Adventure – I’ve never thought of Cambodia as a holiday destination but after reading about Denise and Kuanyin’s travels and seeing their photographs it’s a real contender for a trip when we have the time and money. Uniform Mysteries – Denise is training to be a teacher and at her school the uniform which has to be worn by her and Kuanyin each day of the week changes, sometimes at the whim of the school! I say every day should be a purple shirt day! The Great Plern Cafe Search of 2014 – I’ve pretty much been able to find everything I have wanted in Darwin so far but can imagine how frustrating it must be not to be able to find the cafe, particularly with such amazing looking cakes. I hope they find it soon. The Mariners are Natalie, Landon and their little girl Britton and they live in Charleston in between their adventures together. The Importance of Home: The Other Side of Travel Blogging – This post really struck a chord for me as whilst I love Darwin and life here, there really is no place like home. 5 Reasons to Visit Antarctica – Penguins that is all! Although the other reasons are fantastic reasons too. Have Essentials, Will Travel – A great list of essentials to work from when packing for your next adventure! Home Made Gel Ice Packs – perfect for me, especially after burning my arm on the lid of the BBQ when turning the gas off, constant trips and falls and most recently putting my foot into the blade of the freestanding fan when trying to lay down on the sofa. Hawaiian Grilled Pork Chops – I LOVE anything with pineapple in it and I keep meaning to get better at cooking with pork so this recipe is on the list to try. Chocolate Malt Milkshakes – The Aussie is a big fan of malt in chocolate milkshakes so I may have to give this one a go as we more often than not, now find that cafe’s won’t have malt available. Also don’t forget to take part in the Blogging Elite New Year New You Giveaway that is running until 26 January 2015. Today is the last day to enter the Travel Tribe Blog Hop competition to win a $50 Amazon gift card. All you have to do is comment on each member of the Tribe’s post for the competition and complete the Rafflecopter entry form which you can find on Andi from Misadventures with Andi’s post for the hop. Good luck and enjoy reading everyone’s festive posts before the contest ends on Jan 4 at 11:59 PM PST! As I mentioned in this post I have been participating in the Blog Love Travel Blog Tribe Hop! I thought I would share all of the posts from my fellow Tribe members just in case you missed them. Don’t forget to visit all of the posts and leave a comment so that you can participate in the competition to win an Amazon voucher. Jess from North and South Nomads wrote a fantastic round-up of her favourite blogs for 2014. If you are looking for some blog inspiration then you should definitely check out her post. Natalie from Cosmos Mariners wrote about Christmas traditions in Charleston here – do you think you would be brave enough to take the Polar Bear Plunge? I wrote about my favourite Christmas Traditions here. Andi from Misadventures with Andi wrote about Christmas in San Fransisco. There’s so much to do there and I would love to try the buttered rum! 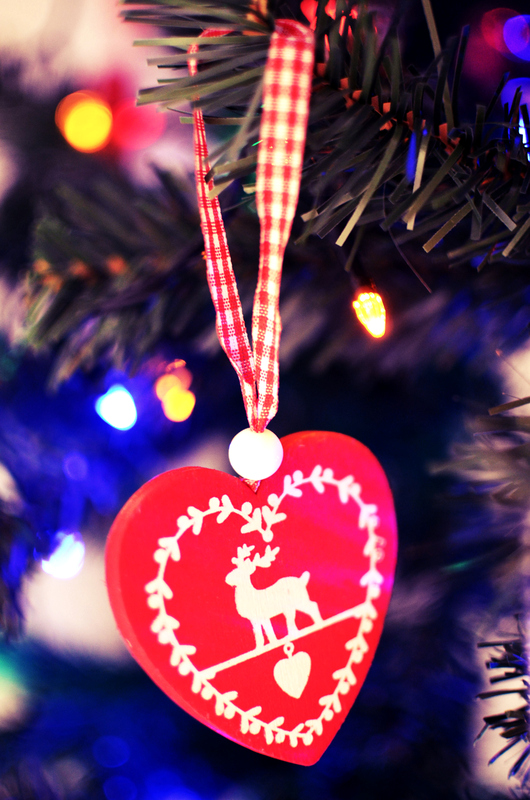 Denise from Kuanyin’s Travels about the meaning of Christmas for her and her gorgeous son. Barbara wrote about life on the circus train for her first married Christmas for her post. To enter the competition please visit Misadventures With Andi and click on to the rafflecopter contest at the bottom of the link. Somehow there are just 3 sleeps until Christmas, how did that happen!?! I have just half a day of work left until my holidays and I cannot wait to be able to sit back and relax for a couple of weeks. 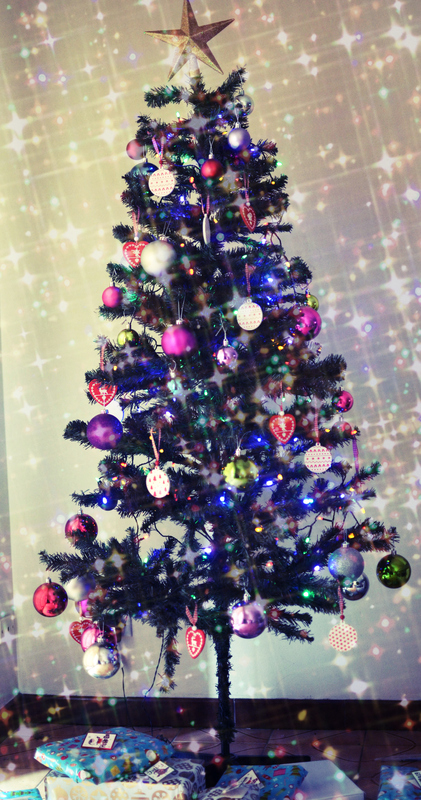 I’ve also finally put up our not so little Christmas Tree this weekend and am loving the festive spirit it creates. I also watched Love, Actually which was as great as always. This year we weren’t able to fly back to the UK for Christmas with my family due to those annoying finances. I am though already planning the trip next year and cannot wait to spend lots of time with my family and friends (only about 50 weeks to go!). We’ve planned to spend the day with a couple of our friends in Darwin this year. They are from America so it’s going to be fun and interesting to combine our different traditions together. We’re going to be cooking some yummy food on the BBQ and of course in the Aussie tradition will be hanging out around and in the pool! Christmas in Darwin is quite different than Christmas in the UK. It’s obviously much hotter (around 33 degrees C versus 12 degrees C) plus there’s about 70 to 80% humidity so all you want is an ice cold drink (cider for me please) and to live in the air con and/or a swimming pool. Last year we had Christmas lunch under the veranda whilst it rained most of the day. It was very strange being sat outside at Christmas. The weather also influences what we do and most importantly what we eat on Christmas Day in each country. As a family we would probably only have turkey a couple of times a year, at Christmas and Easter so it’s a bit of a special treat and I always look forward to sitting down with the family on Christmas Day for the turkey with all the trimmings including pigs in blankets (sausages wrapped in bacon), sprouts (apparently I used to steal them from everyone’s plates at Christmas which must have been pleasant) and you can’t beat some bread sauce. In Darwin, and Australia really, I understand that it’s more likely that you would eat some roast beef or lamb than turkey. Ham is also popular as well as anything you can cook on the BBQ and your less likely to have a full roast dinner because it’s too hot to cook which is a shame as you can’t beat some proper roast potatoes. 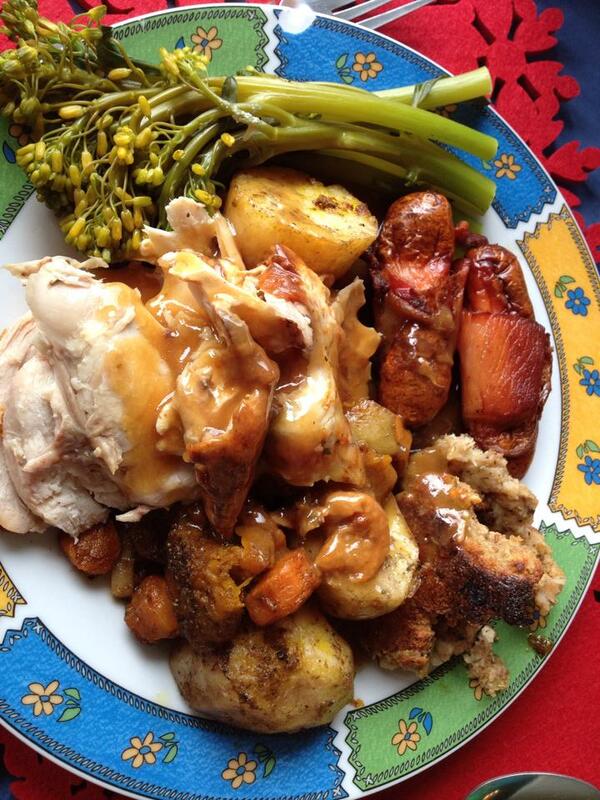 I did have a go at a full roast last Christmas and managed to cook it all on the barbie! The Aussie’s brother is visiting us on Boxing Day for lunch and we’re planning a bit of a full Christmas dinner then depending on how hot its is. I’m definitely wishing we had a BBQ still because it would be great to stick everything in it to cook whilst sitting in the cool house rather than running around in the kitchen. We also always watch the Queens Speech with my family and I am looking forward to sitting down and watching it because they also show it here for us because Australia is a Commonwealth Country. I am looking forward to watching the Doctor Who Christmas special after watching the trailer recently. It also will be on here before in the UK because of the timezones so will have to make sure I don’t give away any spoilers because my brother is a HUGE Doctor Who fan. In the evening in the UK, after watching all the Christmas TV specials we would sit down around the table again and enjoy some cold meats, pickles like pickled beetroot or cabbage which is amazing. We probably won’t do that here this year but instead I am really really excited to FaceTime my family when they open their presents on Christmas morning. Last year we did the same and whilst I wish I could be there with them FaceTime is the perfect way to feel part of the day with them. Last year I even got to sit down with them whilst they ate their Christmas lunch, though I had food envy!! My Mum’s a fantastic cook. 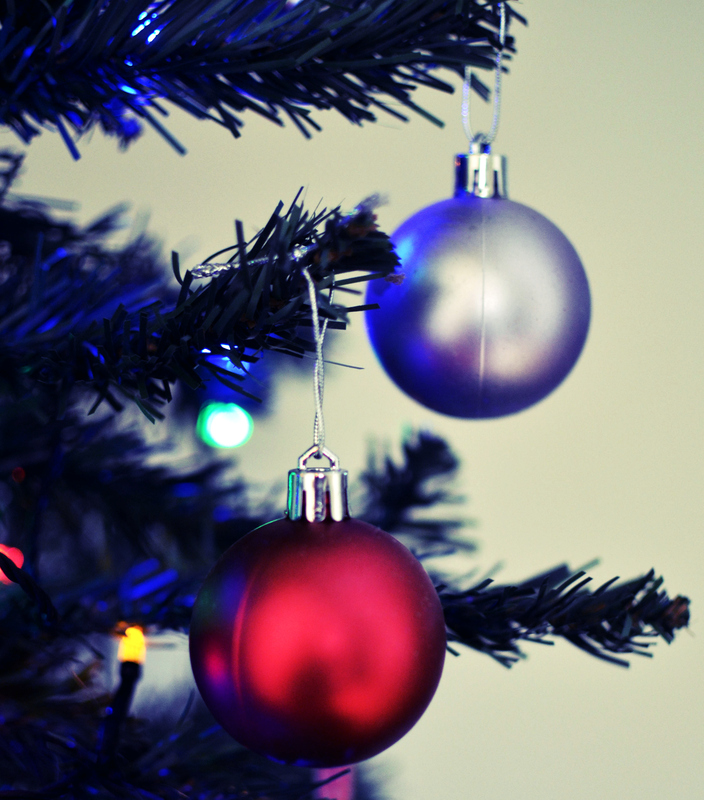 What are your families Christmas traditions? What do you always look forward to at Christmas? Check out the other posts from our Blog Love Travel Tribe Blog Hop. You can find all of the links here.